The cargo pod is in space carrying thousands of pounds of supplies as it waits for its next chance to dock. 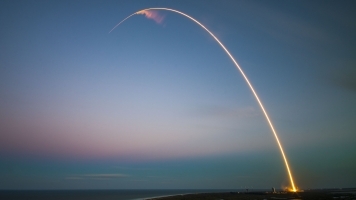 SpaceX launched a cargo pod into space — but it couldn't reach its target. The Dragon pod took off on Sunday. It was supposed to deliver thousands of pounds of supplies to the International Space Station. But the spacecraft had to abort its mission after the GPS system noticed an "incorrect value" in data measuring the pod's distance to the ISS dock. Apparently, the pod was only about three quarters of a mile away from the station when the error happened. It's the second glitch to delay the mission. The pod was originally supposed to launch Saturday, but a steering problem was found only a few seconds before takeoff. This is SpaceX's first mission from the Kennedy Space Center since one of its rockets blew up last year. The Falcon 9 rocket exploded during fueling. Luckily, nothing is wrong with the Dragon; it's in space recalculating how to dock with the ISS, which should happen Thursday.